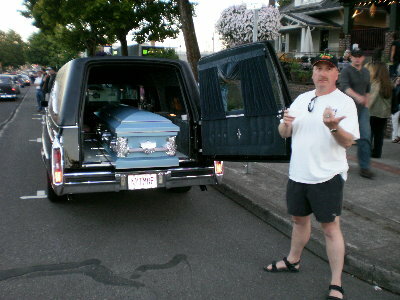 Jeepers Creepers has recently joined the Coffin Cruisers Hearse Club of Portland, Oregon. 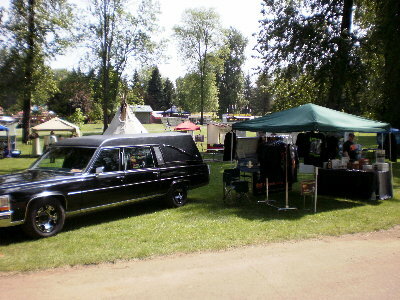 We are excited that we will be attending a lot of Haunts in the Portland, Oregon metro area in the fall. 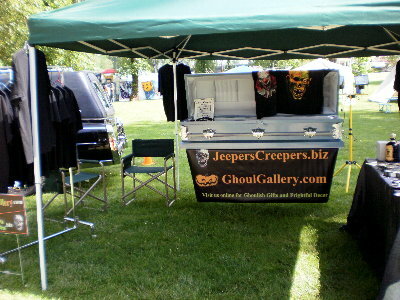 Jeepers Creepers, along with our friendly "Hursula" (our Hearse) attend various events throughout the state. 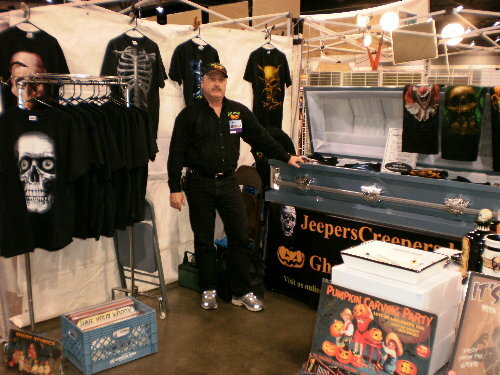 We display shirts and limited items for sale. 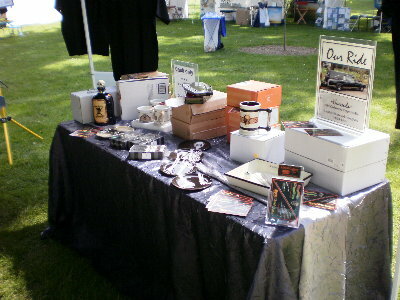 Please stop by and visit us. 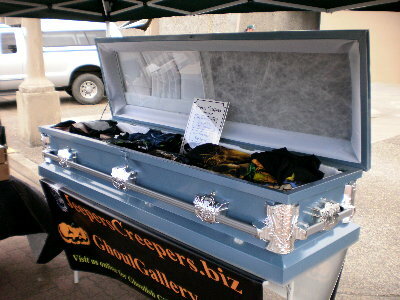 "Hursula" has attended the following events. See below for photos at these events. 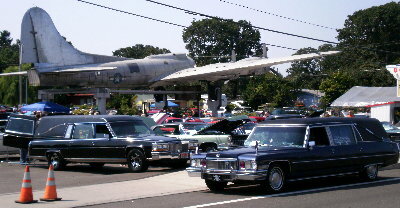 August 2nd - The Bomber 17th Annual Cruise In. 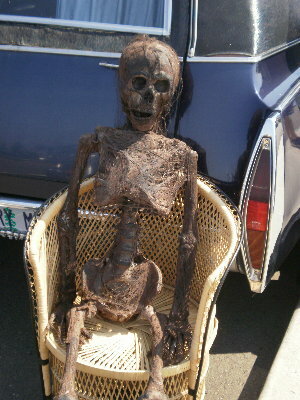 October 2-3rd - Halloween Bizarre Driveway Sale, address coming soon! 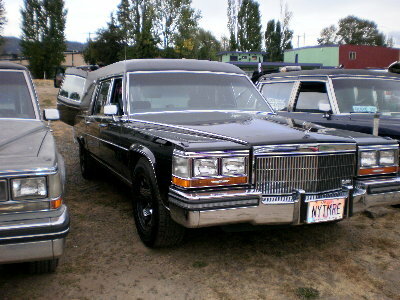 "Hursula" our Crypt deVille parked in the lot alongside other Cadillacs. 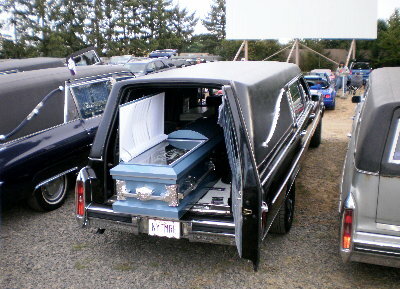 We belong to the Coffin Cruisers Club here in the Portland-Vancouver area. 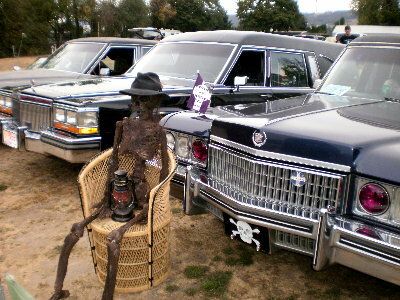 A fellow Cadillac Hearse joined us for the day. Thanks Darin! 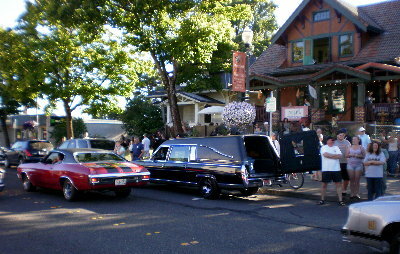 Coffin Cruisers buddy, Darin Campbell brought his friends along in his Cadillac Hearse. July 30th - Hursula makes her appearance. Friday nights throughout the Summer. This event was a big hit - one of our favorite events of this season. 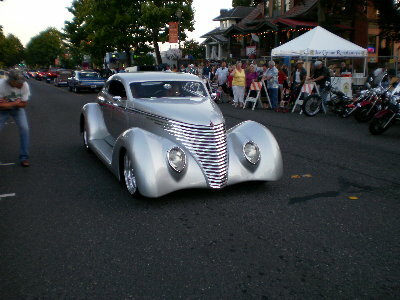 Hours of cars of all makes, years and sizes cruisin' up and down Main Street in downtown Vancouver, Wa. 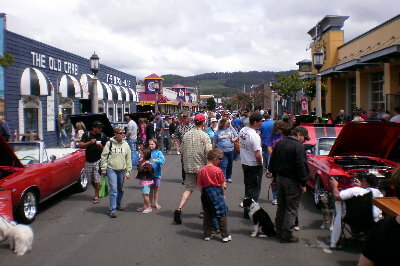 To the delight of the crowds, autos were doin' high powered burn outs. Even local police and fire departments brought out there old equipment to cruise. 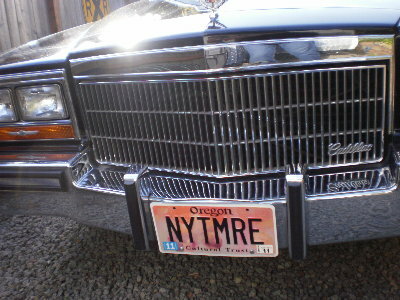 We'll be back for 2011. 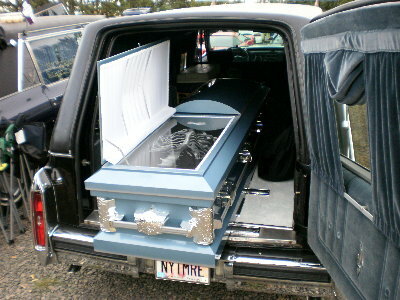 Our "Hursula" had a wonderful time. 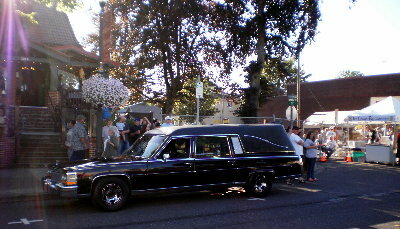 She was quite popular with the crowds - many of whom had never been that close to a hearse or even a casket. 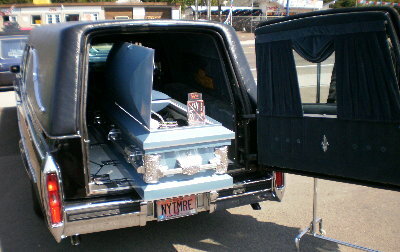 Crypt Cadaverac Driver Dave stood guard over the casket and its contents. 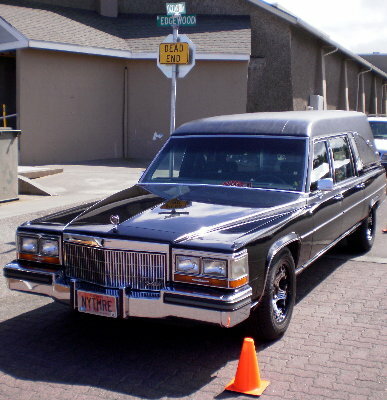 Below - this is not a hearse, but looks like a funeral flower car. 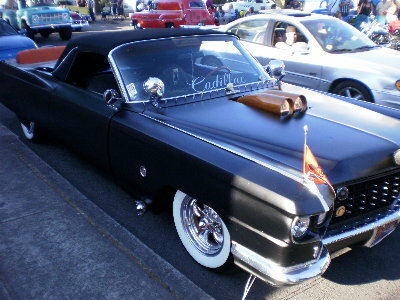 The designer chopped a few Cadillacs together. The back lid is actually a second hood. 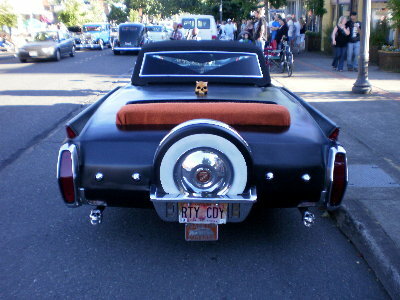 This auto was so cool that it belonged on our pages. 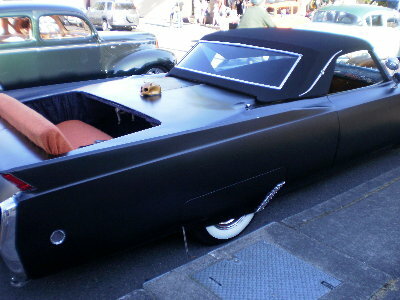 We could just see one of the Munsters family members driving this around town - Grandpa Munster where are you? And two more selections. 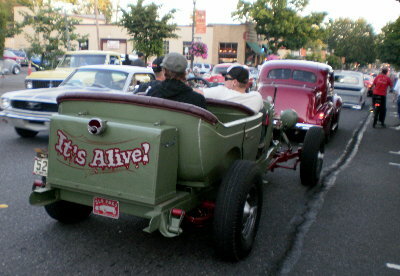 The It's Alive car was really cool. Hard to see in this photo, but they had added stitches around the car as if it was "Franken-Auto." The silver one below was just plain spooky. 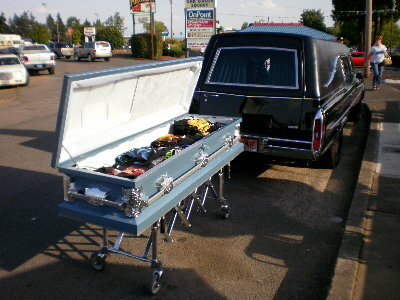 Would have loved to have seen it in flat black with ghouls on it. 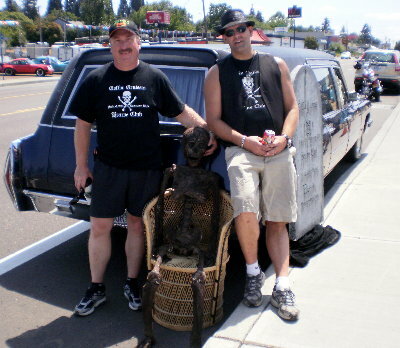 What a fun time this was in Vancouver, Washington. 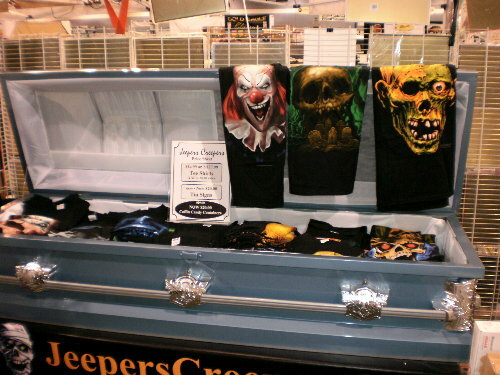 (A cheery casket full of scary tees) Broadway was packed with car enthusiasts.